Got this press release from our friends at Ubisoft, which basically details the fourth year of Rainbow Six Siege along with new editions, and a free to play weekend on February 14th-17th. Check out below or on the official website for the full details. Today, Ubisoft announced that Tom Clancy’s Rainbow Six Siege will be available to play for free from February 14 to 17*. This Free Weekend is the perfect occasion for newcomers to join the Rainbow Six Siege community. This Free Weekend also comes with up to 70% discounts on the game on all platforms starting today. For more information on the Free Weekend, please visit the Rainbow Six Siege official website. In the meantime, Ubisoft also announced details around the Tom Clancy’s Rainbow Six Siege Edition, Deluxe Edition, Gold Edition, and Ultimate Edition, to support the start of brand new content for Year 4 of Tom Clancy’s Rainbow Six Siege. Players can purchase the new editions starting today. All current Year 4 editions will see a price reduction. For all Rainbow Six Siege Starter Edition owners, they will be converted to the progression system for unlocking the original 20 Legacy operators, for more information on this and the DLC Operator Price Reductions please visit the Rainbow Six Siege official website. The Ottawa developer Breakfall who released Pizza Titan Ultra on PC earlier this year will now be giving PlayStation players their chance at the pizza delivering robot action game. Can check out the trailer and a blurb from the PlayStation Blog below. It’s highly customizable with tons of rad looking parts, so you build your own sweet pizza delivering machine! You move through a destructible city, generally trying not to make too much of a mess. But you can basically destroy the entire city. As you run between delivery locations, you get more money and more time for each delivery. Always racing the clock and always delivering pizzas, story missions then add additional objectives." The game is up for pre-order right now which gives you a 20% discount, as well as a copy of the studios previous game: Starwahl. Pre-order link is right here, and the game will release August 21st. Snowman's infinite runner Alto's Odyssey is currently on sale on the iOS store right now. The game is enjoying a 60% discount which is normally $4.99 USD but is $1.99 USD for the next little bit. 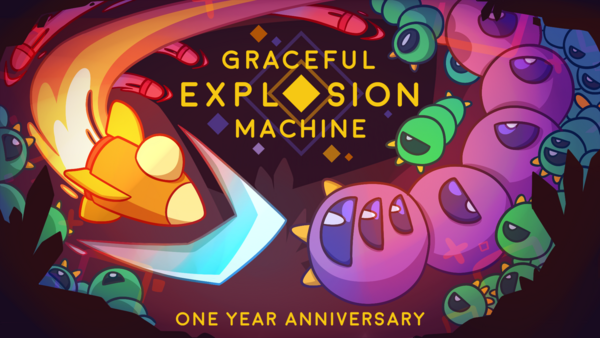 "I began prototyping Graceful Explosion Machine in mid-2015. The initial spark was creating a shoot-em-up with multiple weapons that the player could switch between effortlessly. It started with two weapons, but pretty soon I thought “Wait, why stop at two? !” With four face buttons on a controller, wouldn’t four weapons work? It did, and everything else grew from there." "Speaking of which! We are definitely working on a new game, and we’re excited to share it with you… but not just yet. For now, let’s state the obvious: it’s an action game, it’s colourful, and it’s coming to Nintendo Switch in 2019"
Announced late last year at PlayStation Experience, DrinkBox Studios announced today that Guacamelee! 2 will be coming to Steam - infact you can add the game to your Steam wishlist today! We're excited to announce that Guacamelee! 2 is coming to Steam! Both versions of the game are said to be coming "soon", however to celebrate, DrinkBox put all their games on massive sales on Steam so check it out! Something I often hear from game developers is their troubles with marketing. How to get your game out there to as many players as possible? A usual follow up topic to that is, when the game gets released it has all sorts of hype/press surrounding it, but unless it really takes off, the hype dies down - how do you combat that? Enter: Throwback Thursday - a weekly article on a game that came out from the local Toronto scene back in the day. Maybe you forgot about it, or maybe you never knew of its existence. That's what I want to do with these articles. Check out the first one below, and let me know on Twitter what you think! First up! Monumental Failure from Scary Wizard Games. A game that just hit its 1 year anniversary recently, and is on a 35% sale on Steam. "Monumental Failure is a historically (in)accurate physics-based monument construction simulator. The game empowers you to recreate some of the world's most impressive architectural feats using incredible, and hard-to-believe, construction techniques." "This game is extremely goofy and wonderful. I love being able to build no matter how shoddy the final result is. The coop is hilarious. A great party game. May or may not cure cancer." "8/10 - Would drop my workers out of a plane, strapped to a 40-ton slab of stone with bungie cords, without a parachute, as a delivery system for Stonehenge again." "I don't review games usually, but this game is just so much fun/frustration to play with someone couch co-op. I genuinely recommend this game. The game mechanics are different from level to level so you need to learn on the fly, it's really challenging but is really satisfying when you get it right!" So head over to Steam, pick the game up in a sale, and follow the guys on Twitter. If you have a game that would make a good Throwback Thursday - let me know on Twitter! Nintendo is celebrating the new year with a sale, and a couple of Toronto games are involved. You can also check out an AMA where all the developers involved answered questions from the fans - including Vertex Pop saying they were thinking of a sequel or DLC on GEM, but are instead moving onto something new.